Christmas is over but it’s almost time for another kind of season… whale watching season. Mexico and marine life have a very specific bond, and there are few places where it is felt more strongly than along the coasts of the Baja Peninsula. With the Pacific Ocean on one side and the Sea of Cortés on the other, this is one of the best locations anywhere to witness nature’s magnificent wonders. The Sea of Cortés is one of the world’s unique ocean environments, and is considered by some to be the most biologically rich body of water on earth. In late December through early March, it also happens to be one of the premiere whale watching destinations in the world. The sparkling seaside resorts of Cabo San Lucas and San Jose del Cabo (better known as Los Cabos or simply “Cabo”) are the ultimate location on the Baja Peninsula for whale watching. 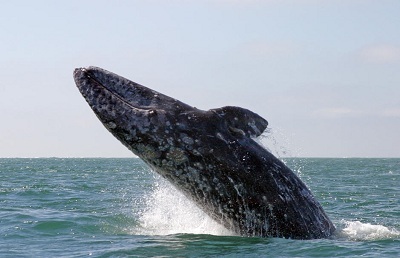 Each year an estimated 12,000 of the world’s 21,000 Gray whales make a 6,000-mile journey to bear their calves in the warm waters of the Pacific lagoons to the north of Los Cabos. From there, many continue south, veering around the tip of the Baja into the crystal waters of the Sea of Cortés. Here they find peace and freedom and provide whale-watchers with incredible thrills. At birth, the Pacific Gray whale is approximately 15 feet long. As adults, their average length can be from 40 to 46 feet (about the same as a Greyhound bus! ), and they can weigh up to 35 tons. They spend their summers northwest of Alaska in the Bering, Chukchi, and Beaufort Seas before making their way toward Mexico for the winter. The journey to Mexican waters is a lengthy trip for the gray whales that travel in pods as small as three whales and as large as sixteen members. Though they only swim at about five miles per hour, they are extremely agile. Diving as deep as 500 feet, they can stay under water for up to 30 minutes. Since they are mammals and surface to breathe, they have two blowholes near the top of their heads. You can hear them spouting from nearly a half a mile away and the stream of water shooting from their blowhole can rise 10-13 feet above the surface. In Cabo, at the height of the migration, these amazing creatures are so close they can easily be seen from shore. Several hotels and cafes also have patios overlooking prime whale viewing areas. 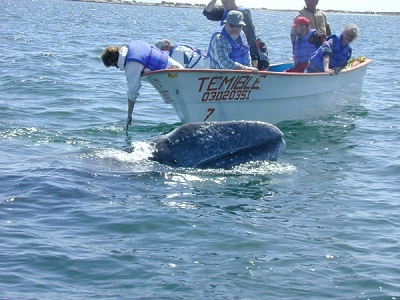 Many local tour companies also offer whale-watching trips. There are two-and-a-half hour boat tours in the bays around Los Cabos, either by the catamaran or powerboat. In the sheltered lagoons of the Baja, the calves learn survival skills and gain strength by swimming against the ocean currents flowing into the calmer waters. The calves weigh around 3,000 pounds and are about 19 feet long when they are ready to leave. Magdalena Bay is one of the most famous breeding lagoons in the area and it’s not uncommon for the “friendlies,” as they’re called, to approach the small boats (“pangas”) of whale watchers. The sweet-tempered leviathans often approach the boats and welcome a gentle rub from humans… truly extraordinary. You can reach “Mag” Bay by plane or bus. There are countless tours available through your hotel in Los Cabos or you can book online before you go. The excursions from Los Cabos usually include snacks on board the boat and lunch at a local restaurant. It’s an encounter with nature not easily duplicated. In Los Cabos, there’s more than great golf and beautiful beaches, there’s a chance to be involved with some of the most unbelievable creatures on the planet. Check it out if you can, it will be one of the most memorable experiences you’ve ever had. Disclosure: I am being compensated for my work in creating and managing content as a Community Manager for the Mexico Today Program. All stories, opinions and passion for all things Mexico shared here are completely my own. Mexico Today is a joint public and private sector initiative designed to help promote Mexico as a global business partner and an unrivaled tourist destination.